Pinot Gris is one of those grapes that tends to excite some discussion regarding style. In Italy you find some generally lightweight and inoffensive wines, labelled (in Italian, funnily enough) as Pinot Grigio. And in France (in the Alsace, one of my favourite regions and sadly one I’m yet to visit) it’s labelled as Pinot Gris and tends to be made in a slightly weightier, more complex style. This latter is definitely my preference and there does seem to be some consistency with Australian producers using the French or Italian grape name in order to mark out the style of the wine in the bottle. Of course, this is tending towards a convention, rather than mandate, so it’s still very much a case of caveat emptor. 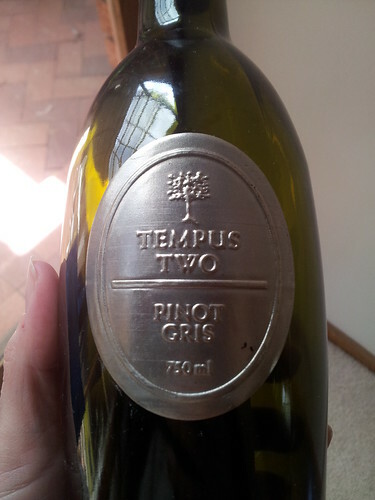 I picked up this Tempus Two 2011 Pinot Gris from the local bottle shop where it was marked down to $17 a bottle. Usual pricing is around $10 more and according to the internet, a retail price of around the $25-27 mark seems about right. Tempus Two wines have the funky little pewter ‘labels’ that make them stand out on the shelf so this wine should be easy to spot. In the glass, the wine was pale straw with just a hint of green to it. The nose was a little tight, not giving up too much, but there was a slightly spicy characteristic along with crisp pear and apple and a touch of lemon. Things looked promising. In the mouth, the same pear and apple came through and the acidity was pretty good. Unfortunately, the wine came across as a touch unbalanced with the alcohol really dominating the finish along with some unripe pear. The wine had good mouth feel and weight to it: it had the extra oomph that I’d expect from a Pinot Gris but overall I felt the palate just didn’t live up to the nose. I won’t be rushing back to buy up the shop’s remaining discounted stock: the back label is quite explicit that this is a wine for drinking young and a tiny part of me also wonders if this bottle had been subjected to some slightly less than ideal storage at some point … Having said that, I will be keeping an eye out for the 2012 (current release) and giving that a go. There was enough of interest in this bottle to merit a look. $17 from Cellarbrations, Flagstaff Hill.